Wanted were from Santo Tirso, Porto. The project began in the beginning of October 1991, by Rui guitar and Pedro drums, who invited Nanú guitars and Francy bass. After 15 days Wanted gave their 1st concert, even without a defined repertoire, playing various covers. In April 20th 1992 the group enters the Avé Mania studios (located at their home town) to record live what would be their 1st demo tape, entitled "Handled Without Care". 5 tracks were part of the demo: "Time Bomb", "Who's This Guy", "Money God", " I'll Will" and "Desolate Ways". In September, Fancy leaves the band. After three months is replaced by Xola (ex-The Darkness) and by a new vocalist named Carlos Martins (ex-The Darkness). 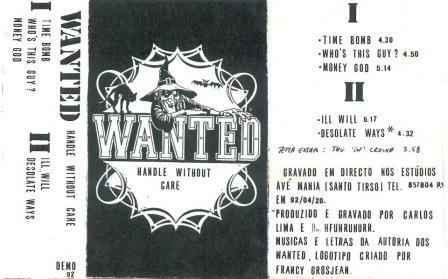 Wanted plays live 15/16 times in the surroundings of Santo Tirso and Vila Nova de Famalicão. In January 30rd 1993 they played at their home town, at the Téte-a.Téte bar. 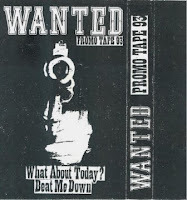 With a new line up, the group enter the same studios in which they recorded their first demo tape, and recorded 2 tracks, for their promo tape 1993, "What About Today?" and "Beat Me Down".